The prize of diamondback terrapin conservation is a healthy, growing population of this non-migratory species that had been declining towards extinction for the last century. Achieving that prize means increasing recruits into the adult cadre to stabilize their numbers and then to transform decline into increase. That whole process begins with hatchlings. Saving large numbers of babies bolsters the natural population with lots of new recruits. Turtle Journal and its partners protect nests laid from early June through late July with predator excluder cages to get eggs safely through two to three months of incubation. As hatchlings emerge from these nests, volunteers assist them in making the most dangerous passage of their lives … from nests in sandy beaches, dunes and banks to protective camouflage either in thick lowland salt marsh or in thick upland vegetation. Highly vulnerable hatchlings simply need a good hiding place for their first winter snooze before they begin foraging in the nursery salt marsh next spring. 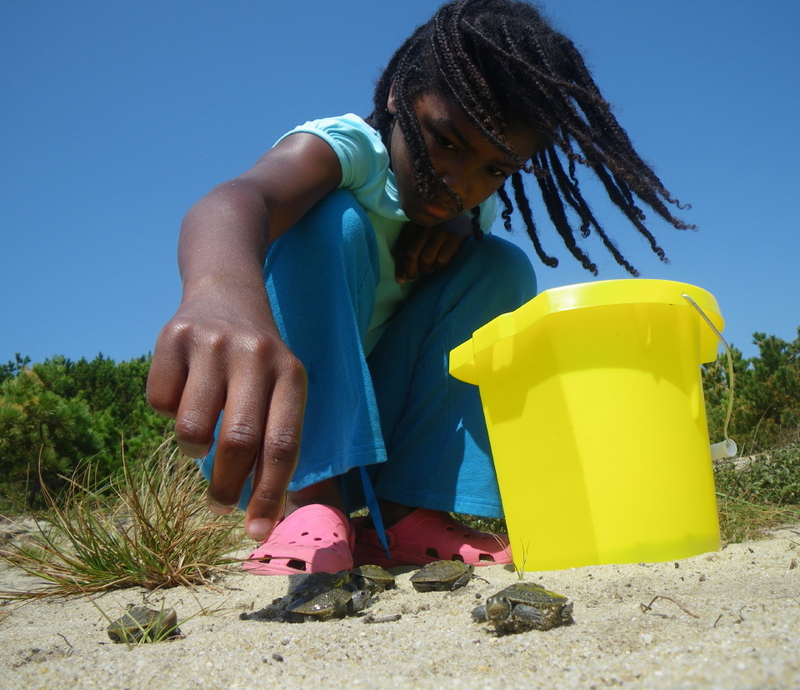 On Saturday, Jayla met up with the Turtle Journal team on Lieutenant Island to learn about threatened turtles. 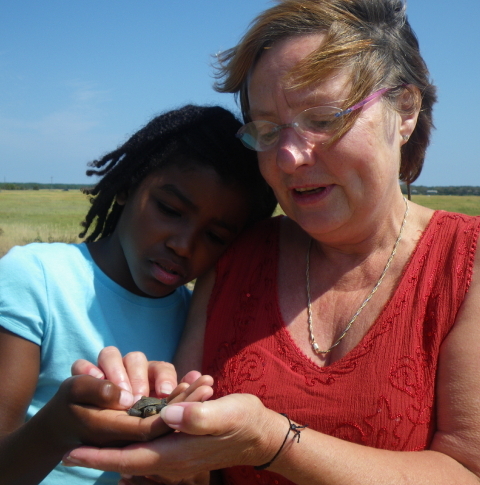 She had an opportunity to release 30 tiny hatchlings that had emerged from nests over the previous 24 hours. As Jayla gently lifted the babies from their pails at Turtle Point, she watched carefully as they scrambled in random directions to find a safe place to hide. 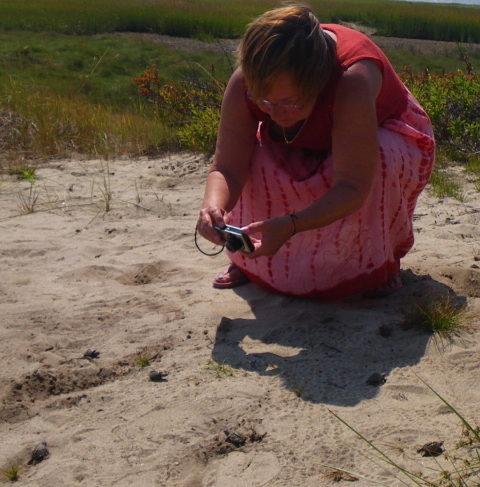 Maire, who accompanied Jayla to discover the mystery of Cape Cod’s elusive terrapins, tried as best she could to document the mad scramble of tiny hatchlings crisscrossing Turtle Point in search of a safe spot to hide from hosts of voracious predators. Before leaving Turtle Point, Jayla and Maire studied one of the hatchlings up close and personal. And like all who bring a hatchling into their hands, they bonded with the little critter, a perfect miniature version of its parents. Unlike mammalian infants, these tiny hatchlings lead independent lives from the moment of their emergence from the nest; their parents’ DNA alone provides everything they need. But also unlike mammals, the chance of a baby’s survival lies somewhere between one in two hundred fifty to one in a thousand. Yet, under the watchful eye of the Turtle Journal team and its partners on the Outer Cape, odds of survival to adulthood are increased to as high as one in eight, giving this threatened species a substantially improved chance of avoiding extinction. 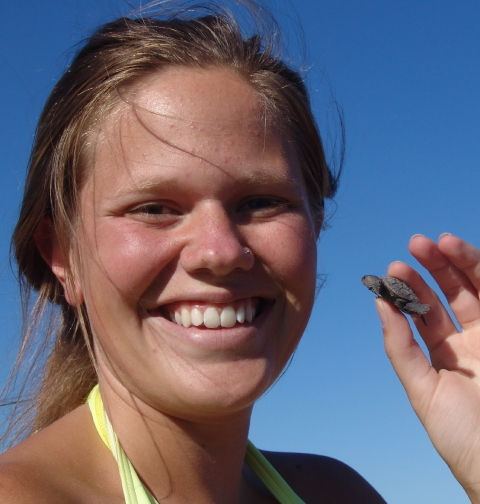 With aggressive nest conservation begun in 2000, the steady decline in terrapin numbers in Wellfleet Bay slowed, and then stabilized in mid-decade. Within the last few years, the trend fully reversed and the Wellfleet population is now growing once again. 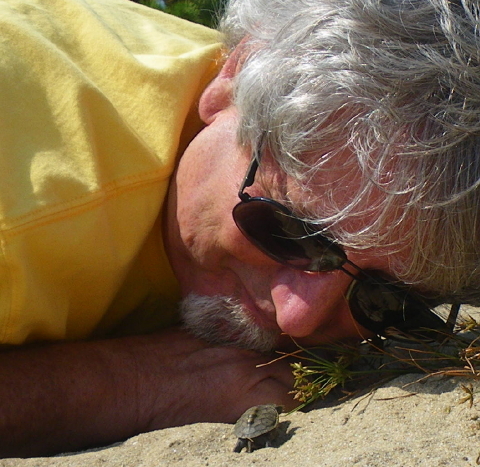 Labor Day Weekend brought our first diamondback terrapin hatchlings of 2011 to the SouthCoast of Massachusetts. These precious babies were saved from the threat of Hurricane Irene last weekend. 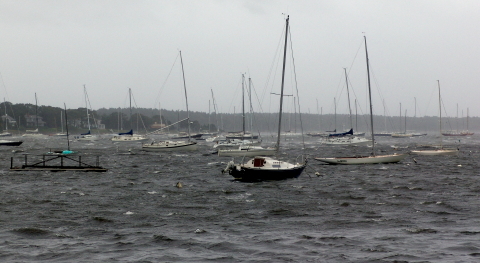 Irene punished the SouthCoast of Massachusetts, and especially Buzzards Bay, with a flooding storm surge synchronized with astronomically high tides at new moon phase. Nesting sites all along Buzzards Bay became inundated by hurricane surge and were raked by pounding surf. The Turtle Journal team and volunteers had rescued vulnerable SouthCoast nests just before Hurricane Irene’s arrival, and these nests began hatching during the holiday weekend. In Marion, the Aucoot Cove barrier beach supports the densest concentration of terrapin nests. With its southerly exposure, Aucoot Cove was ground zero for Hurricane Irene’s surge, which tore across its narrow width. Fortunately, all known nests from this area had been relocated before the storm. And on Sunday, three terrapin babies, which had “pipped” open their eggshells, scrambled to freedom when one of these rescued nests was exposed to sunlight. These hatchlings had been deposited by their mother in their Aucoot Cove nest on June 11th and had been incubating for nearly three months before their emergence. 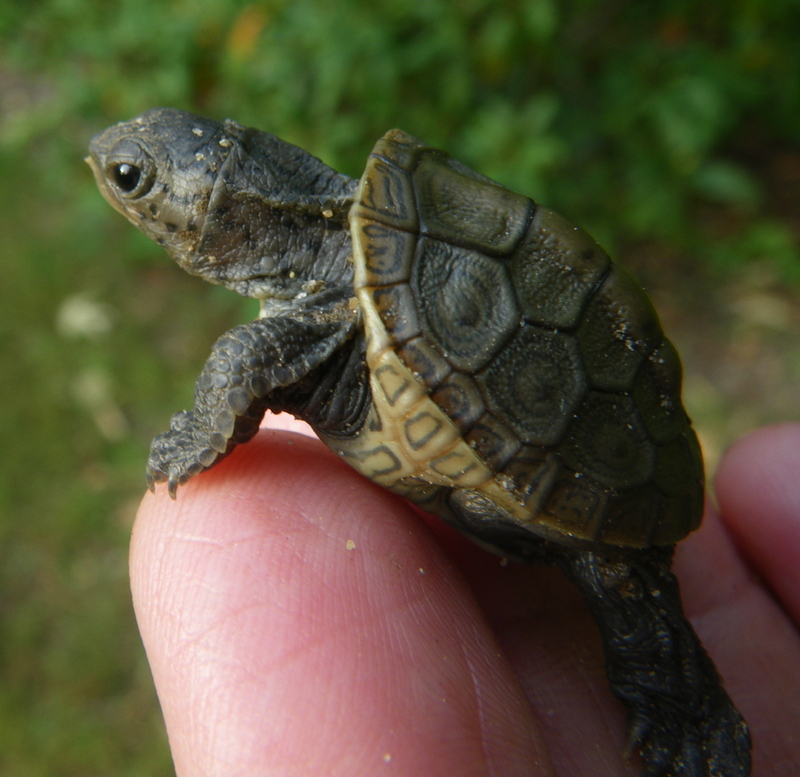 Although only an inch long and weighing about a quarter ounce, hatchlings are completely independent from the moment they break loose from their eggshells and scramble to freedom. These babies will be returned to their natal nest location on Aucoot Cove for release into the wild. Earlier in the weekend Jackie Fougere discovered a tiny diamondback terrapin hatchling that had crawled onto her towel at Silvershell Beach in Marion. 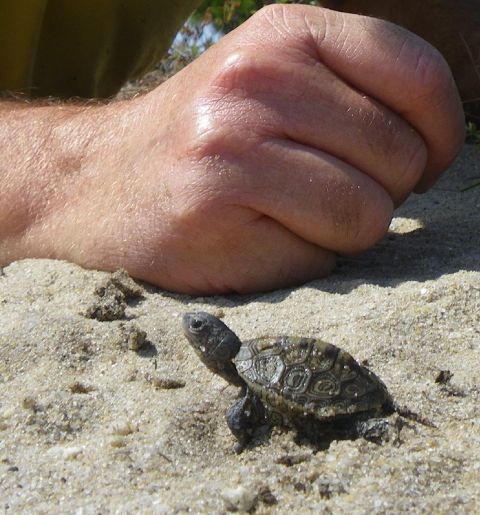 This baby represents the first terrapin hatchling we have documented at Silvershell Beach. It may have emerged from an elusive nest dug by its mother on this busy summer beach, or this hatchling may have been bounced around Sippican Harbor by Hurricane Irene’s turbulence. When discovered, the hatchling had already discarded its egg tooth; so, it was probably more than a week from emergence. This rescued hatchling was a bit dehydrated and required rehydration before release. Yet, after soaking in fresh water for a day, this baby had regained full vitality and was ready to fend for itself in the wild. 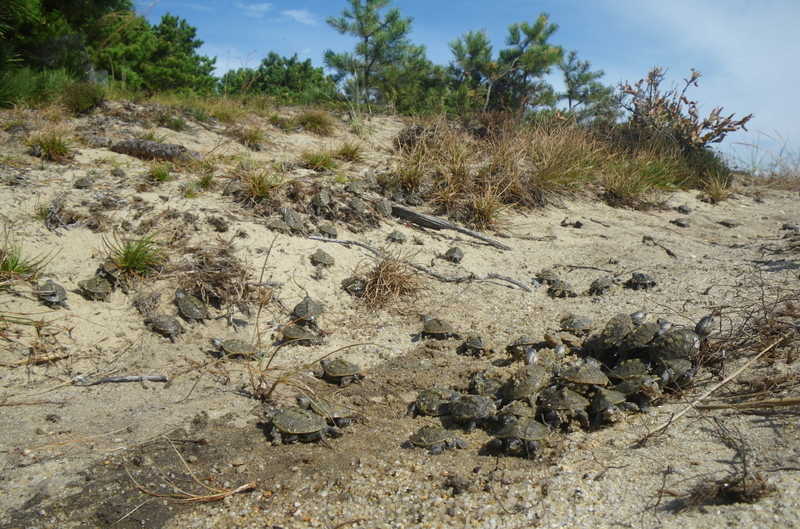 An event like Hurricane Irene, timed to arrive at a highly vulnerable point in the terrapin nesting cycle, could nearly wipe out a year’s crop of hatchlings. With a local population already on the brink of extirpation, the loss of an entire annual cohort might prove catastrophic. 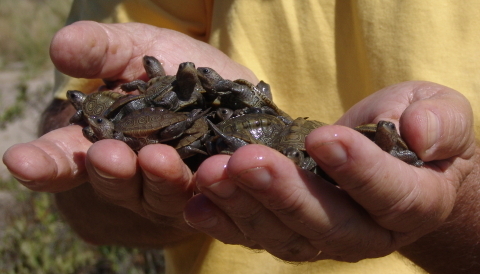 Yet, thanks to an aggressive conservation effort on the SouthCoast of Massachusetts, hundreds of hatchlings were saved to assume their role in reconstituting this threatened population. 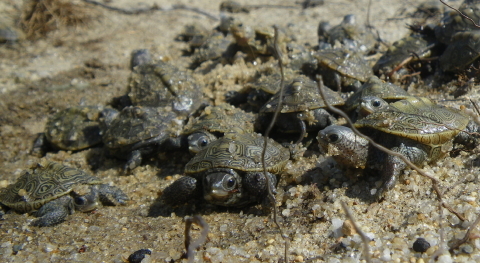 Diamondback terrapin hatchlings keep emerging from Lieutenant Island nests harvested in advance of Hurricane Irene. One hundred ten eager babies broke out of their eggshells and tunneled to the surface of their sand buckets in the Turtle Journal sunroom incubator on Monday and Tuesday. Sue Wieber Nourse released them at their natal site at the tip of Turtle Point on Wednesday morning. Rarely does one have the opportunity to witness more than a hundred threatened terrapin hatchlings in one place at one time. These healthy babies couldn’t wait for their chance to break for freedom and scramble to the safety of camouflaging vegetation. In typical “drunkard’s walk” randomness we have observed for more than a decade of terrapin hatchling conservation, some hiked upslope into the thick bearberry (hog cranberry) cover. Many slalomed downhill toward the salt marsh’s Spartina patens. A few simply crawled in circles and then dug a temporary hiding spot right in the soft sand of Turtle Point. Hatchlings continue to emerge and Turtle Journal will return another large batch of terrapin babies to Turtle Point on Labor Day Weekend. 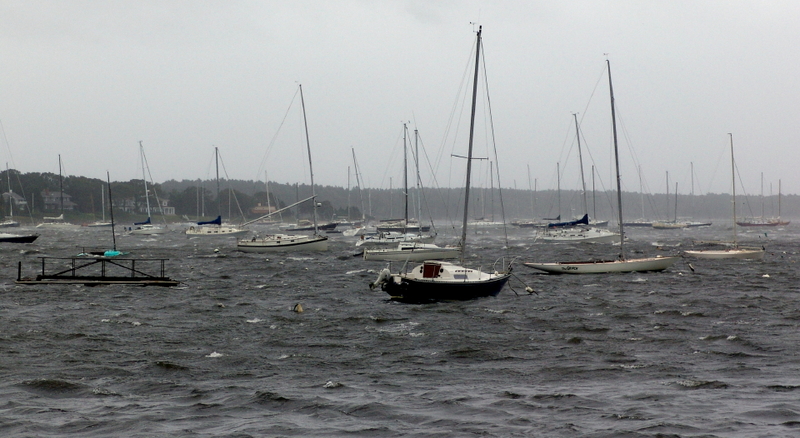 Hurricane Irene stormed into New England on Saturday night and Sunday. Before its arrival, the Turtle Journal team harvested diamondback terrapin nests vulnerable to the forecast storm surge. Each nest was carefully excavated. Eggs were transferred to sand-filled buckets that were moved to the sunroom incubator at Turtle Journal Central. As Hurricane Irene approached and as the barometer plunged, hatchlings tunneled to the surface of their bucket nests. They circled and waited, never noticing the 70 mph gusts, never hearing the limbs crashing around them, unconcerned that electricity and modernity disappeared in the intensity of the storm. They simply waited for release. On Monday after the storm passed, the Turtle Journal team returned fifty hatchlings to Turtle Point on Lieutenant Island in South Wellfleet on Outer Cape Cod. 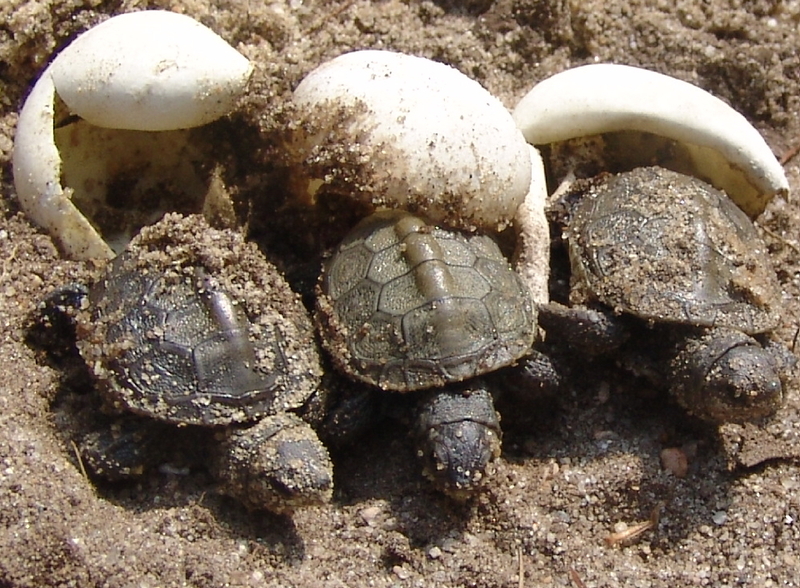 Placed at the tip of Turtle Point, hatchlings scrambled in every direction looking for the cover and safety of vegetation. One hundred ten more hatchling were released on Thursday, and several dozen that have emerged overnight will see freedom on Saturday morning. Nothing like a tropical storm to kick the diamondback terrapin hatching season into high gear! 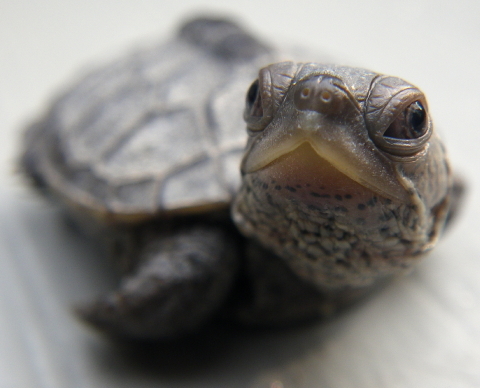 You are currently browsing the Turtle Journal blog archives for September, 2011.